This is the dramatic moment a female hunt saboteur clashed with an angry man as she tied to monitor an event in Birdingbury - and was left hospitalised with a cut to the face. The footage shows the woman and a colleague having a furious row with the male in a field. The West Midlands Hunt Saboteurs members claim they were trying to monitor members of the Warwickshire Hunt when the incident happened on Thursday November 9. At one point the man orders them to leave before pushing the woman over - and seconds later he appears to slap or swipe at her face. Shortly after the alleged attack, the man can be heard shouting "you can hit me if you want", as blood pours from the woman's eyelid. The alleged victim was later taken to Warwickshire Hospital A&E for treatment, the group claim. The 5.07 minute video - which was shot by a male saboteur - starts with the woman confronting a man on horseback, who tells her that he is hunting rabbits. When the suspected hunter refuses to tell her where their trail is, she barks back: "Why won't you tell us where your trails are? Where are you going all day, then? Where are you going next?" An angry man is then filmed approaching the pair on a country footpath and, when asked whether he is hiding something, he is heard shouting: "Yes, I'm trying to hide something because you're not meant to f****** be here. "I just don't want you to video things you're not allowed." When told that he is blocking the saboteurs filming, he says: "Yeah, I am because I've got a right to. You don't have a right to be here." When questioned on whether he is hunting rabbits, the man, dressed in a biker jacket, says: "Rabbits? Shows how much you know, you f****** idiot. "I will stand here all day and I will follow you all day. You will not wander where you like. I don't know who the f*** you think you are." As the saboteurs attempt to walk down the footpath, the man repeatedly shouts: "What are you doing?" Shortly afterwards, a man in a brown fleece approaches them and says: "You're not welcome here. Get gone, now." When one of the saboteurs claims there is "illegal activity" going on, the man puts his hand in the camera and pushes it away, saying "get gone" again. As the cameraman stumbles, the angry man then can be seen approaching the woman, and dramatic still images appear to show him slapping her across the face. The furious man then shouts "you do what you want, now get out", as he pushes the female saboteur - wearing a white jumper - to the ground. Lying on the muddy footpath, she can then be heard saying to her radio "I have just been assaulted. I've just be slapped in the face." The woman, with a cut above the eyelid, then gets up and tells the man "so you hit women?" to which he responds "you can hit me, if you want". The film then cuts to the pair talking to another man sitting in a car, who apologises to the woman and says: "That shouldn't have happened." The furious female then approaches a car full of well dressed men and women, and says: "Do you want to hit women?" At that point another woman - who the saboteurs claim is the hunt master - responds: "You're not a woman." When asked what the saboteur is, the lady bluntly responds: "A monster." A spokesperson for West Midlands Hunt Saboteurs said: "We were concerned that the hunt were hunting a fox and that the hounds were heading towards a busy main road. "Suddenly two hunt supporters approach us and start shouting aggressively before attacking us. "It shows what type of people fox hunters are that they think it acceptable for men to attack women, punch them and then shove them over from behind." Lee Moon, spokesperson for the Hunt Saboteurs Association, stated: "Fox hunting, by its very nature, is a violent activity and it is only a short leap from using violence towards animals to using violence against people. "This was a completely unprovoked attack. 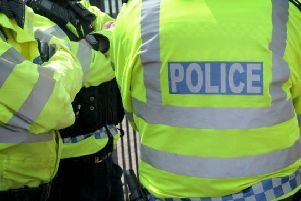 Inspector Allison Wiggin from Warwickshire Police said: "We are aware that a video of this incident has been shared widely online and has attracted a lot of interest. I would like to reassure people that we will be conducting thorough enquiries and speak to everyone involved. "If anyone witnessed the incident or has any other information that could help with our enquiries then I would urge them to contact us."